Hatters boss Nathan Jones definitely won’t be taking tomorrow’s FA Cup second round opponents Bury lightly. Although not drawn on whether he would make changes for the tie, Jones knows that with the Shakers absolutely flying in League One, up to fifth with five wins from six games in all competitions, scoring 22 goals last month. The Luton chief said: “Like we do with all games, we plan, we look ahead at the month, we’ve got a lot of games. “So we’ve got to make sure that everyone’s ready and everyone can play, and everyone’s getting game time, but also that we are competitive enough in every game that we try and win it. “We won’t be taking this tie lightly in any way, if we do make any kind if changes it would be for the right reason. “But they’re in good form at the minute, plus we’ve got a game on Wednesday as well, which means if I was looking to give people game time, I’d have a perfect opportunity on the Wednesday. “So we’ll prepare in away as if it was a league game and then we’ll go from there. “It wouldn’t be significantly noticeable if we did change it with a number of changes or one or two to freshen things up, because we’ve got a lot of like for like, got a lot of difference in there that can also freshen it up and give us different threats and different securities if you like. On whether Kazenga LuaLua, who has missed Town’s last two games, will be available for the trip to Gigg Lane, Jones said: “He’s a lot closer than he was last week, so without giving too much away or saying something that will come back to haunt me, we’ll have to see how he reacts. 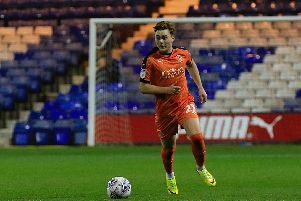 Jones also refuted any idea that he would use the match to get game-time in players like fit-again midfielder Luke Berry, saying: “I’m not looking to get anyone minutes, I’m looking to win the tie and that’s what we’re going to try to do. “It won’t be a charitable mission this weekend, because we can’t because these are a good enough side that will punish any laxiety in our preparation, any laxiety in our aptitude as they are a very, very good side. “For me they’re as good a side that’s in League Two and they play a very different way to a lot of teams in League Two and that’s the biggest complement I can give them.